An LBO (Li2B4O7) walled ionization chamber was designed to monitor the epithermal neutron fluence in boron neutron capture therapy clinical irradiation. The thermal and epithermal neutron sensitivities of the device were evaluated using accelerator neutrons from the 9Be(d, n) reaction at a deuteron energy of 4 MeV (4 MeV d-Be neutrons). The response of the chamber in terms of the electric charge induced in the LBO chamber was compared with the thermal and epithermal neutron fluences measured using the gold-foil activation method. The thermal and epithermal neutron sensitivities obtained were expressed in units of pC cm2, i.e., from the chamber response divided by neutron fluence (cm−2). The measured LBO chamber sensitivities were 2.23 × 10−7 ± 0.34 × 10−7 (pC cm2) for thermal neutrons and 2.00 × 10−5 ± 0.12 × 10−5 (pC cm2) for epithermal neutrons. This shows that the LBO chamber is sufficiently sensitive to epithermal neutrons to be useful for epithermal neutron monitoring in BNCT irradiation. 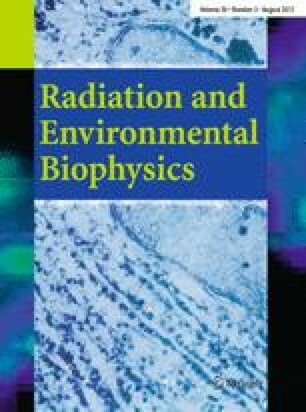 The authors are grateful to the staff at the Biological Effects Experiments (NASBEE), National Institute for Radiological Science (NIRS) for their excellent operation of the accelerator. This study was performed as collaboration between Hiroshima University and NIRS. The authors are also grateful to Mr. Atsushi Higashimata, Sanki Industry, for manufacturing the LBO chamber. This research was supported by Japan Society for the Promotion of Science KAKENHI Grants Nos. 26257501 (April 2014–March 2018), 24310044 (April 2012–March 2015) and 15K00544 (April 2015–March 2019). The authors declare that there are no conflict interest.